I see a noticeable difference between the two conversions. With Foorbar2000 as the better converter (IMHO). Difference in file size is ~2160bytes. What is the reason for it and how do I get DBpoweramp make also high quality CBR 320 conversions? P.S. Under advanced quality is set to -q 0 (slowest, high quality), No DSP effects. Last edited by Tigerman; 02-11-2019 at 02:48 PM. And what exactly leads you to believe one is better (or sounds better) than the other? To me these spectrums look the same with the exception of a few negligible differences. 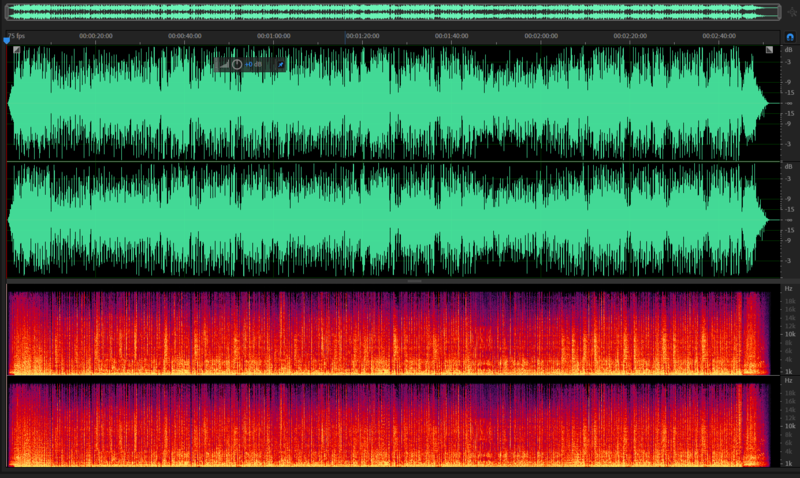 What's more, if you're really interested in Audio Quality don't use mp3, use a lossless codec like flac. Edit: Just a thought, couldn't such minor differences be caused by different versions of the lame encoder? Last edited by oeci; 02-11-2019 at 06:59 PM. I'm not talking about if it's audible or not. When I use a converter with LAME, I expect the same quality with the same settings compared to another converter with LAME. It's clear (to me) that LAME with DBpoweramp removes more than LAME with Foobar. So I want to know why and what to do about it. P.S. I have my whole collection in FLAC. There are user-cases where FLAC is not the best solution (p.e. a car stereo which does not support FLAC). CBR files have exact filesizes, what are the exact filesizes of the two files? and the song length? This is a random file I picked. Total length of file is 2:54. Filesize Lame DBpoweramp 7.126.044 bytes, with LAME Foobar 7.128.116 bytes. I came across the difference with Fakin' the Funk. I know that this program is not always trustworthy, but when the same flacfile is seen as a true CBR320 when converted with Foobar and as a fake when converted with LAME DBpoweramp, then there's something not the same. This is not always the case. Sometimes both files are seen as true CBR320, but sometimes the file converted with LAME DBpoweramos is seen as fake. I'm just curious why this is. If DBpoweramp uses LAME, then there should not be a difference. At least not such a difference that I can see a line at 16kHz with LAME DBpoweramp which is not there with LAME Foobar. Last edited by Tigerman; 02-12-2019 at 05:32 AM. and you can see the exact command line sent to lame if you turn on debugging in Control Centre. You can also encode to wave and manually feed that file with the same command line to lame.exe to see what it produces. dBpoweramp R16 uses Lame 3.100 which was released in 2017, 64 and 32 bit versions. It is likely that for 320kbps that foobar is adding an extra command line parameter to not limit the overall frequency to 16KHz (which lame it's self is deciding to do based on how to best allocate quality / filesize). Last edited by Spoon; 02-12-2019 at 06:34 AM. What exact lame command line is being issued in fb2000? In dBpoweramp you can also look on the advanced page for the lame codec, this shows the command line. P.S. because of the filesizes are almost the same, I inclined to think that bitrate is not the problem. More the way it decides which sound can be removed. As for Foobar, I don't know. I just point Foobar to Lame.exe and select 320 kbps CBR. That's it. Don't know how to display the command line in foobar. I will fool around with LAME DBpoweramp this evening. Last edited by Tigerman; 02-12-2019 at 07:28 AM. Are you sure you are using the same version of lame in dBpoweramp and in foobar2000, when performing the conversions? ... and, are you sure that you are passing the exact same parameters to lame from dBpoweramp and foobar2000? I replaced the LAME.exe that came with DBpoweramp with the one I use for Foobar. It produces exactly the same file. So it's not the LAME.exe that causes the difference. I enabled debugging and the DBpoweramp CLI reads -b 320 -q 0 -noreplaygain. When I look for the meaning of that on page https://wiki.hydrogenaud.io/index.php?title=LAME then I see halfway through the page: -b 320 is an alternative to the VBR settings above. So maybe that is the cause of the difference? If so, how do I get rid of -b? If someone knows what de CLI of Foobar is, let me know. I can't find it. Last edited by Tigerman; 02-12-2019 at 11:32 AM. Until you know what command line foobar is using you are just guessing to the difference. Also it is lame and the lame developers who decide to filter everything above 16KHz because they believe it gives higher overall quality when using CBR, to force 22KHz to be preserved goes against the knowledge of the lame developers who have spent 1000s of hours with 1000s of different types of file. If you get rid of -b then it is not a CBR, it would be VBR, you can change the mode on the main encoder page. I was jumping the gun. After reading the whole page I can see that -b is for constant bitrate. After some testing with the command line, it's the -q0 that causes the difference. If I send only -b 320 --noreplaygain then I get the same result as foobar. So is it possible to get rid of the -q0? Last edited by Tigerman; 02-13-2019 at 08:47 AM. Thank you. That was it. Now Foobar and DBpoweramp give the same result.